Available in 1-1/4 Quart, 2-1/2 Quart & 4-Quart Capacities. Featuring Gold Accents & Wing-Style Handle. Server features our ‘AA’ All-Angles Axle System, allowing the cover to hold position at virtually any angle. In order to activate the resistance force, the server cover must be opened to a 45 degree+ angle, every time the cover is lifted. Remember to order your inserts. Spring USA offers a full line of full size, half pan & white porcelain inserts. Looking for a replacement cover? Request Item #E371-6/36E. Over time, axles can wear down. Replacement Axles Kits are available for our sauteuse servers. Request Item #EAK-142A or Item #AA-644. Your Spring USA Sales Coordinator can assist you with ordering. Available in 1-1/4 quart, 2-1/2 quart & 4 quart capacities, featuring Chrome Accents & Wing-Style Handle. 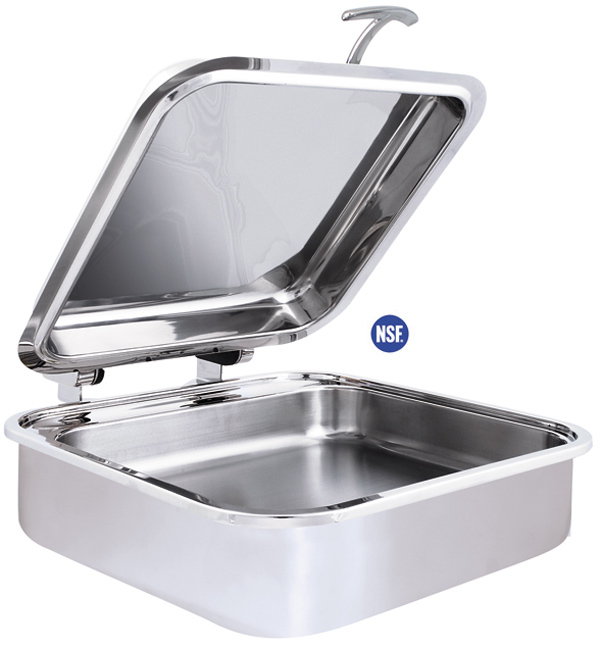 7 ” H x 19-7/8” L x 15-5/8” W ~ 6 Quart Capacity, featuring Chrome Accents & Wing-Style Handle. 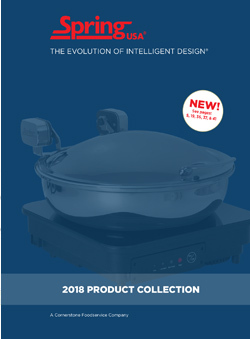 All inserts available for our rectangular convertible buffet servers can be found in our Catalog, on page 21. Over time, axles can wear down. Replacement Axles Kits are available for our servers. Request Item #EAK-150A or Item #AA-648. Your Spring USA Sales Coordinator can assist you with ordering.